Heralding the victory march of indie music, The New Yorker in August trumpeted about Montreal, Canada-based art-band Arcade Fire’s sold-out two-night stand in Central Park. The shows launched The Suburbs, the band’s third album after Funeral (2004) and Neon Bible (2006). The album dislodged Eminem’s Recovery from the US Billboard summit after debuting on top in the UK. This phenomenal chart success, scripted by an ambitious, imaginative and fortunate indie act, has arguably etched the epitaph of the music industry as we know it. Arcade Fire tells patient, involved stories. Their music is artistic, layered and rich in instrumentation. Live, they flaunt the jigsaw bits that comprise the mosaic of their orchestral sound, performing with an ensemble of medieval museum showpieces like hurdy-gurdies and glockenspiels. Lead vocalists Win Butler (a Texan who migrated to Montreal via New England) and his wife Régine Chassagne (born to Haitian refugees) formed Arcade Fire in 2004 with Win’s brother William Butler (synthesiser, bass, guitar and percussion) and multi-instrumentalists Richard Reed Parry (double bass, celesta, keyboards, drums, electric guitar and accordion) and Tim Kingsbury (bass guitar, guitar and keyboards). They are joined by violinist Sarah Neufeld and drummer Jeremy Gara. On tour Arcade Fire performs on a busy and crowded stage, with the extra hands stepping deftly aside for Will’s animated theatrics. Their tour calendar is packed with dates in North America and Europe, as well as in Japan and Brazil. The enormous success of Suburbs is not a one-off. Despite being decisively indie, Arcade Fire’s endeavours have consistently courted recognition. Funeral was nominated for Best Alternative Rock Album at the 2005 Grammys and for three BRIT awards. David Byrne wrote them a fan letter and joined them in concert. David Bowie followed suit. A tryst with U2 followed, with Arcade Fire supporting the Irish heavyweights in a series of concerts culminating in a memorable encore before their home crowd in Montreal. With 16 tracks, Suburbs retails with eight randomly assigned cover art variations. But it isn’t only the wizardry of indie label Merge Records that has taken Arcade Fire places. Technically, the band has been on the ball. Each song on The Suburbs was originally recorded on a 12’’ acetate disc and recorded back for the album’s digital master to achieve a uniform listening experience. 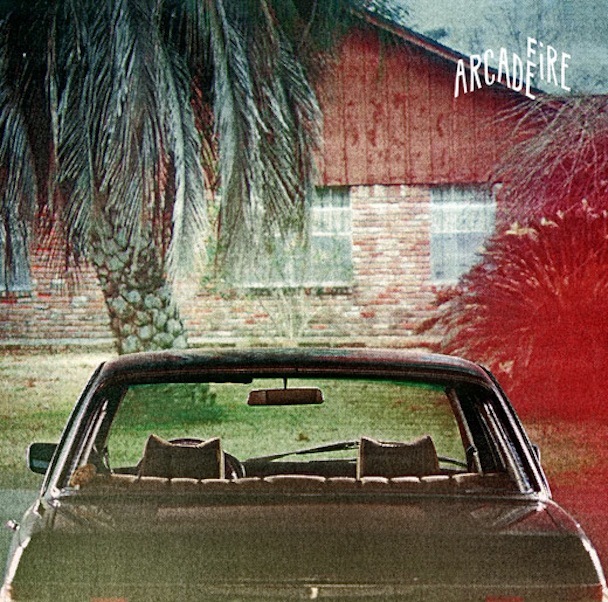 With characteristic indie inventiveness, Arcade Fire has established a compelling online presence, adeptly “leaking” album previews on P2P networks such as Limewire and iTunes. A sleek video website showed off Neon Bible. This year they made news with The Wilderness Downtown, an interactive movie by Chris Milk featuring “We Used to Wait” from the new album. The music, however, makes the strongest statement. The Suburbs offers a listening experience that is transcendental, awe-inspiring and sonically orgiastic. The infectious chorus of the title track, reprised, lingers hauntingly. “Wasted Hours” and “Deep Blue” (yes, about the chess-playing computer) are engrossing. But it is hard to pick individual tracks on merit as they are strands of an absorbing yarn spun of superlative song-writing. If Butler’s thespian vocals don’t grab you the violin and keyboard parts will, helped immensely by the imaginative multi-part harmonies. It all adds up to sheer aural theatre.